From 5-7 February Surface Design Show 2019 will take place at London’s Business Design Centre to provide a unique platform for architects, designers and specifiers in the capital to explore the best in interior and exterior surface materials, lighting design, development and innovation. Jennifer says of the New Talent participants: "With my team at Trendease, travelling around the globe scouting new talent, innovations, and market directions‎, we develop a network of design professionals that help take the industry towards a brighter future. For our collaboration with Surface Design Show we are pleased to present a collection of startups who will inspire the attendees of the show. Many of the new talents are available for commissions and some have their own product lines, while others are providing services like micro manufacturing. By supporting the talented new market entrants, Surface Design Show will be highlighting the freshest ideas in material design”. Creative design atelier MUUNA produce bespoke fabric developments. The studio takes a progressive approach to surface design, combining specialist skills such as hand weaving and embroidery with unique processes to create innovative and sensory surfaces. MUUNA can be commissioned to undertake specific projects or collaborations and can custom produce materials for an array of applications such as encapsulations, wall coverings and installation.? Charlotte Jade offers an eye-catching range of hand drawn designs that celebrate the fascinating plants and animals living on our planet. The ethos behind the company is simple: to reconnect us with the natural world. Based on the concept of biophilic design, the Charlotte Jade collections focus on the benefits of bringing elements of nature back into our lives, to reduce stress, aid mental wellbeing and improve productivity. By celebrating the shapes, form, patterns, textures and colours prevalent in our natural environment, Charlotte Jade brings the outside in and restores our affinity with nature.? In her work Enis Akiev is focused on post-consumer plastic waste as a resource. 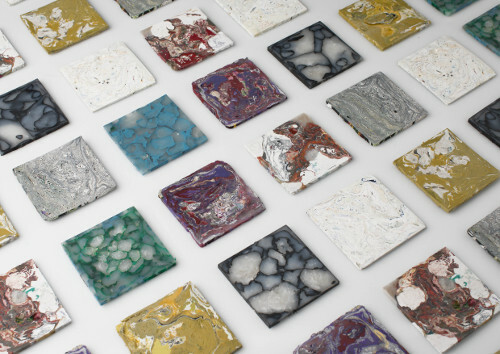 Her Plastic Stone Tiles, created in a process inspired by rock formation, increase the value of disposable packaging waste and make it accessible as an aesthetically pleasing and durable material. Through her work Enis hopes to “give impulses to rethink the general understanding of resources and to stimulate an exploration of materials”. Inspired by the luxurious marble veneers of early 20th century interiors, Spelk by surface designer Orla Lawn is a fresh take on decorative plywood panelling. 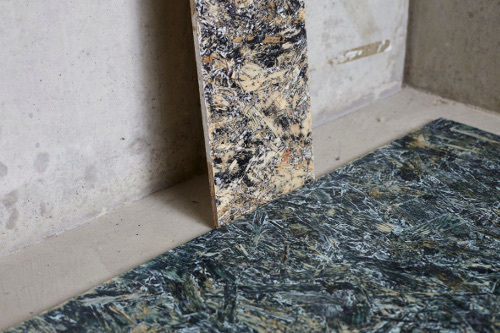 Through developing a colourful handcrafted finishing technique, Orla elevates a common economical building material to an elegant surface product. Spelk has a splintery look with a silky-smooth feel, inviting you to explore through touch. Employing high-end printing techniques and combining them with clever artwork, Carmine Lake’s wallpapers are at once beautiful and smart. Their designs portray new takes on stucco and have fun with scale and proportions. Visitors will find it hard to resist reaching out to touch these wall surfaces. Other exhibitors are Aya Kawabata Design whose incredible fabric designs hang like artwork; Blue Bamboo Designs, creators of biophilic inspired cork and wood wall tiles, screens and coverings with acoustic & thermal qualities; fabric and wallpaper designer Chloe Nalwoga who will show a selection of her gorgeous wallcoverings; artist Laura Evans who will show intricate, colourful pen & ink drawn works; digital print experts Sleek Editions will showcase their fabrics for interior design and upholstery; the hand-made interior wall finishes of Vacarda Design, created using Italian plaster to beautiful textured effect and a selection of Woodchip & Magnolia’s sumptuous and fun wallpaper designs will be on show. Showing the full gamut of surfaces from tile to fabric, the New Talent Exhibitors are ‘ones-to-watch’ and so a must-see at Surface Design Show 2019.